Secluded from the bustling and winding city streets, the Kilkenny River Court Hotel is overlooked by the majestic 12th Century Castle. On arrival to the hotel, you will feel a sense of belonging as our trained team welcomes you to the finest accommodation & dining experience that Kilkenny City has to offer. The Hotel is on John Street near the Bridge. Kilkenny City continues to be one of the most sought after locations for hotel leisure breaks and business guests alike. Of all the hotels Kilkenny has to offer, this superb location in the sunny South East offers ease of access from all areas of the country. 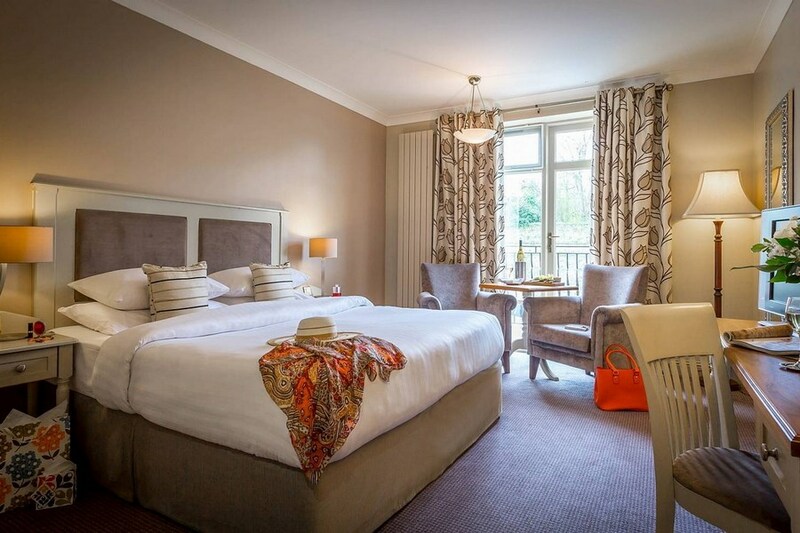 I would like to say that our stay at the Kilkenny River Court Hotel was very enjoyable, the rooms were spotless, the staff were very friendly and helpful. The receptionist welcomed us with a smile and made us feel very welcome. It is very well located, in the heart of the city, beside restaurants, pubs etc. We have no complaints and would recommend this hotel to everyone. Friendly staff.Parking not a problem once you got through the archway way.The hotel iscentral which is a big bonus if you wnat to be in walking distance of shops,restaurants & the castle.A few people made noise on their way to bed so if you are easily woken it may not be for you .I woke very briefly. Breakfast was super everything was fresh and lovely staff again. The hotel was wonderful; the staff were extremely helpful and polite. Parking was a little tricky there but I would definitely go back there. Great location. Perfect breakfast. Nice big room , clean and comfy. Most Staff were lovely.The pool and gym are a bonus. Paying for parking not so good.a little noisy at night but that's to be expected for the location. Myself and my husband just back from a three night stay at the Kilkenny River Court Hotel, and it was just perfect. Location couldn't be better or more scenic. The hotel staff are fantastic, from the minute you walk in the door to the moment you leave. The hotel is beautiful, we stayed on a bed and breakfast basis only, and the breakfast is amazing, such a huge selection to choose from, really sets you up for your day of exploring and sightseeing, you certainly wouldn't be hungry. We have stayed in Kilkenny on several occasions, one of our favourite places to visit, but our first time staying at the Kilkenny River Court. We will most definitely be returning to stay there again and would recommend it to anyone. Stayed on the 4/03/14 for one night BB and evening meal . Staff were friendly food was excellent. Location central close to everything. Hotel was clean and room was comfortable. Will definatly go back. Stayed here last Sunday night.Staff were very friendly. We had booked B&B and evening meal so glad we opted to book an evening meal also. The food was of a very high standard. The hotel is centrally located and only cost €5 for overnight parking. The friendly and warm welcome from all the staff was so nice. The food in the restaurant was absolutely delicious and the ambience in the hotel for the duration of our stay was second to none.They gave us a great room overlooking the river and went out of their way to make our stay so enjoyable. Will definitely go back. Absolute bargain, would seriously recommend this place to anyone. I had only ever visited Kilkenny for the day but staying over really shows another side to it as there's great bars on the doorstep of the hotel. The hotel was beautiful and staff were really excellent. Would go back in a heart beat. I had the chicken in red wine sauce for dinner and my god it was good!! Also it is the most central hotel I saw and it literally faces the castle which is so cool! Hotel was lovely and food was fabulous, however you could hear the guests in the next room talking (even though they were not talking loudly) and our shower did not have hot water. Just back from a 2 night break at the River Court Hotel. Great value dinner, bed and breakfast package. Food was really lovely for both dinner and breakfast. Room was very comfortable. No need for a car as the hotel is in a perfect location overlooking the castle and beside the centre of town. The swimming pool was very relaxing at the end of the day (it closes from 12 to 4pm during the day). Staff were very friendly and helpful. Look forward to staying here again. Fabulous Hotel excellent location for a city break. Had a great Saturday night stay. The breakfast and evening meal was excellent. I found the staff to be very friendly and efficient. I would definitely return again. We stayed on a Saturday night and it was great value at the special rate for b&b. We got a lovely room and it was very comfortable.The staff are friendly. It is such a central hotel you can park up the car and walk everywhere in the town. There are several good pubs and places to eat near so no taxi's needed for the weekend. Had a lovely time in the Kilkenny River court! An excellent central location, ideal for taking time out to relax and unwind in the lovely Kilkenny town. Had really nice treatments in the Hotel spa, and my husband got great use out of the pool. Breakfast was excellent as was the bar snack we had on one evening. Very helpful and friendly staff. We will definitely go back. Would recommend it to anyone. Excellent value, perfect location, Staff helpful & friendly, food at dinner limited and not the greatest but at price we were paying still excellent value, Breakfast excellent, dining room nice atmosphere & location, Bedroom could do with an uplift and other facilities at hotel excellent. Parking 5 euro/24 hours. Excellent break to a lovely hotel with great facilities. The staff were most helpful and the breakfast was excellent. I wouldn't hesitate to book this hotel again. Top marks to the River Court. Great stay, room a little tired, staff lovely, parking five euro. Very enjoyable hotel all the staff were very pleasant at all times . We will return to Kilkenny and stay in the Rivercourt hotel again. Hotel was fantastic and perfect location, rooms excellent. Only negative would be the poor bar service, no system whatsoever and plenty of disgruntled customers. After having spent the previous 5 days in Killarney and cork my self and my husband stayed in the rivercourt hotel Killkenny for one night. It was by far our favorite hotel of the three. The location is fab and the staff at reception and in the Dining room are excellent. We also had lunch out side with a lovely view of the castle and this was also great . We will return. We very much enjoyed our return trip to River Court Hotel in Kilkenny, and already looking forward to a return visit. The location of th River Court Hotel is one of its best features. Its riverside setting, overlooking the castle means you are right in the centre of things, you can leave the car and forget about it for a few days. ( once you have negotiated the small car park!) You can stroll out of the hotel door and begin a beautiful walk all along the riverside, birdsong, flowing river, no cars The River Court is also terrific location to take advantage of Kilkenny shops, And we managed to get Bruck Springsteen tickets in the local music shop! 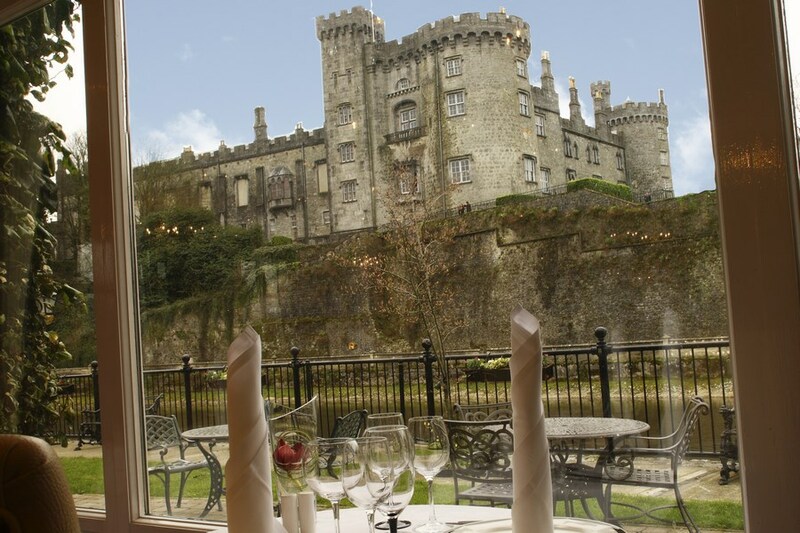 The dining room at the River Court overlooks the Kilkenny Castle and iis one of the reasons we enjoy the hotel. If you can get a window seat, its magic. Its not the plushest dining room you will ever see, ibut the the charm of the castle and the excellent waiting staff make for a very pleasant experience. All this It makes up for the lack of excitement of the food, which is fine, but you dont want to eat there two nights in a row, as menu doesnt change, which seems a pity. There must be great produce to be had locally? Breakdfast was more than adequate, I suppose, but yogurt ran out, no mushrooms, tomatoes so what do vegetarians do? Bread was hit and miss. The therapy room is low key and yes, accessed through the pool which is not ideal, but worth it, I had an excellent massage. Pool was not too crowded , jacuzzi and steam room very accessible but most of all , friendly and helpul staff. Our room on the second floor was spacious, well decorated and to sit by the window and watch the life on the river , you need never leave the room! Bathroom a tad small, and why oh why is there a problem with the towels? No hand towels supplied initially, and really hotel needs to invest in some new towels, we stayed in late April. season just beginning, so why are the towels so threadbare ? Very out of keeping with the rest of the hotels operation, which is , overall , so incredibly welcoming and friendly. Truly, a cead mile failte. Too bad they are booked out the weekend of the Boss's concert! I wonder has anyone told him of the delights of the River Court? Just back from a three night stay at the River Court Hotel. 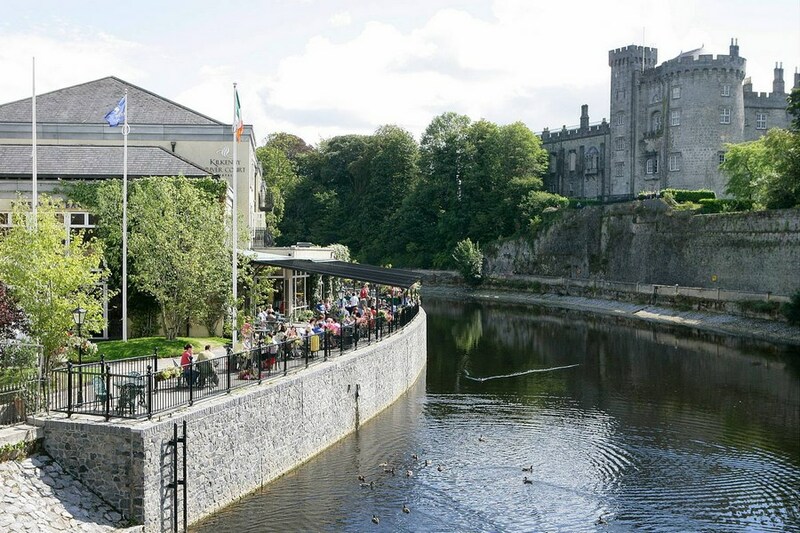 The hotel is in an excellent location in the heart of Kilkenny city over looking the river and the back of Kilkenny Castle. As its off the road there is no real noise from traffic or people late at night. The rooms are traditional in style but very comfortable with everything you need. We were on a dinner, B&B package. The food was ok but nothing special. We had dinner in the restaurant the first night, the menu was limited and the food average. Breakfast was good. Reasonable choice of cerals, juices, fruit, breads etc. Irish breakfast was self service with the usual fare. Very good service for both breakfast and dinner and the staff were very attentive and friendly. On the second night we eat in the bar but again the food was average but the service and staff excellent. There is a lovely area outside overlooking the river and castle where you can enjoy a coffee or pre-dinner drink and enjoy the sun, if you are lucky and we were. We did not use the pool, gym or avail of any of the spa treatments which were reasonably priced. We were charged €10 for parking which I was not happy about. I believe hotel guests should have free parking. Kilkenny is a great location for a short break. The castle is well worth a tour and the grounds are great a leisurely walk or cycle. The cathedral and Smithwicks brewery also worth a visit. Great shopping and crafts in the town. Within easy driving, Castlecomer Discovery Park, Jerpoint Abbey, Nicholas Moss pottery, Mount Juliet so lots of things to do and see and lovely countryside to drive through. i would certainly recommend Kilkenny as a destination to visit and would happily go back to the Kilkenny River Court Hotel. Good hotel, excellent staff and service, great location, need to work on their food offering. Perfectly situated in the heart of Kilkenny. Staff courteous and helpful to a fault. We stayed in a suite which while not cheap was elegant with a fantastic view across the river Nore to the castle. Dinner, better than average hotel fare. Breakfast, adequate but have seen more choice. Make sure to try the Guinness bread. Having to pay for parking, albeit at a very nominal fee seems a bit "cheap". Would we stay again - definitely! A lovely hotel, lovely staff. extremely kind and helpful in every way. Lovely clean and spacious rooms. The pool area and changing rooms were nice and clean. I booked a few treatments in the beauty rooms which were great and the therapist was very good however my only criticism is i had to walk through the pool area to go to the beauty rooms when it would have been much nicer to be brought into the changing rooms and given a robe and slippers before my treatments. A small thing that could make a big difference. The barman Dave was extremely pleasant and helpful and even gave us bread to go and feed the ducks. The food in the bar and restaurant is lovely however i feel the breakfast is a big let down, cheap and tasteless bacon, pudding and sausages, rubbery eggs and not enough fresh produce. i would like to have seen more fresh fruit and produce and more artisan irish produced food. we stayed an extra night as we were enjoying ourselves so much. The general ethos of the hotel seems to be very much based on providing the customer with a pleasant and comfortable stay. Stayed only one night very clean and friendly. Used the pool which was well kept. Hope to go back sometime. Stayed at Kilkenny River Court Hotel on 26th / 27th March 2013 it was a beautiful midweek break. The room was beautiful and spacious the staff were lovely and its a great location.Not forgetting Kim at the Spa she was wonderful, hope to go there again. Well done to everyone really enjoyed my break. I would highly recommend this Hotel. Great place to stay and fantastic staff.Highly recommend. lovley room with a balcony overlooking the river.great location.....all staff very friendly and efficient.....food was excellent....each couple was served a glass on sparkling wine and each lady got a rose complimentary.....a lovely thought......leisure centre was really nice and i had a hot stone massage ......again staff in the leisure centre were very friendly. and helpful ....in all it was a great stay and we will go back again..........only one small thing.....breakfast finished at 10am which i thought that maybe on a sunday could be 10.30am. Stayed at the River Court on Valentine's night and had a lovely time, as usual. My husbnd and I and our 6 year old have stayed here on numerous occasions and the reason we keep returning is because of the location and the quality of the hotel. The staff here are very friendly and obliging. I would have no hesitation in recommending the Kilkenny River Court to any of my friends. Beautiful hotel with fabulous food had a great stay. Spent one night at the Rivercourt Hotel, reception staff were very friendly. Had booked a twin room and assigned a double, called reception and they immediately transferred us to a twin room. The twin room standards were extremely poor (small and grubby) in comparison to the double room we were transferred from, much to our disappointment. The car park is very secure, overnight parking costs €8.50. Really enjoyed my stay here. Staff were very helpful and friendly. Swimming pool and jacuzzi relaxing. The room was warm and clean, We enjoyed a lovely meal in the restaurant. Their cheeseboard was fantastic - more than enough for two people! All of the staff of The River Court Hotel were excellent. They were very friendly, welcoming and very helpful. However we were extremely disappointed to find that the main restaurant is closed on Sundays throughout January and February. That restaurant was our main reason for choosing this hotel so this fact should have been prominently displayed for the "Dinner, Bed & Breakfast" bookings, instead of hidden in the small print on the Hotel's website menu page. The bistro menu we were served in the bar was very disappointing for a 4-star hotel. In fact I would rate it at the low end of 3-star food. The plates and bowls were cold, the "signature burger" was a bought in processed item that was very tough and overall the main courses did not match the descriptions on the menu. The buffet style breakfast was also not hot enough and again the plates were barely warm. In addition to this the temperature of the room was a little on the cool side for comfort. Stayed at river court for one night, can't speak highly enough of staff ,from the time we walked through the door it was a pleasure, food fantastic,leisure centre great , overall a super experience. Highly recommended ..
We stayed at the River Court Hotel Januaury this year as usual accommodation, food were great and we have been there before, If I had one quibble it would be breakfast finished at 10 or 10.30 and it was very busy, a later finsihing time for breakfast would suit some people, but that is only a minor thing.